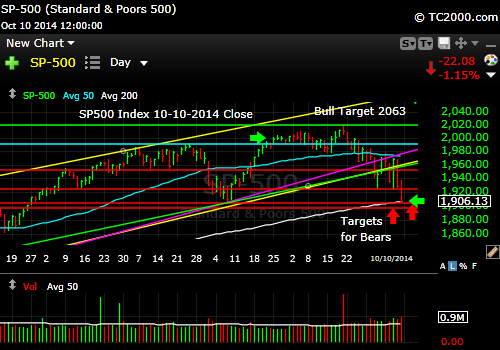 ← Market Timing Brief for the 10-03-2014 Close: Stocks Hit a Bottom. Gold AT the Bottom. Rates Still Low. Market Timing Brief for the 10-10-2014 Close: Stocks and Rates Both Hit Bottom as Gold Rises from a Major Low! The SP500 Index fell to my 1905ish target on Friday. That COULD be it for this swoon. The script is that bounces occur even during the beginning of a Bear market. Is this a Bear? No one can tell you except after the fact, so don’t concern yourself with that speculation. Protect profits where you have them (unless we do in fact bounce Monday) and protect capital by removing some from the markets ONLY if you are willing to rebuy higher if you are dead wrong and end up selling at a low. I would buy this level only if I were willing to sell it below the next level of support shown on the chart below. Otherwise why bother? If you believe the U.S. economy is on the mend still, then this is a buying opportunity and you should be adding more exposure as we head lower. If you followed my advice throughout this year, you have stayed out of small cap stocks and have stayed in large cap stocks until now. But now our allocation even to large cap U.S. stocks is now lower as I said on Twitter (see links just below here). We may add back exposure soon however. 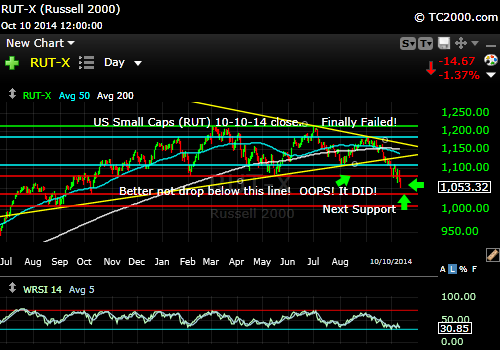 The U.S. Small Cap Chart (RUT, IWM): The small caps broke down further and if you did nothing but listen to my warnings through this year on staying in larger stocks and out of small caps indices, you did much better. Small Caps break to new lows. Watch out below! 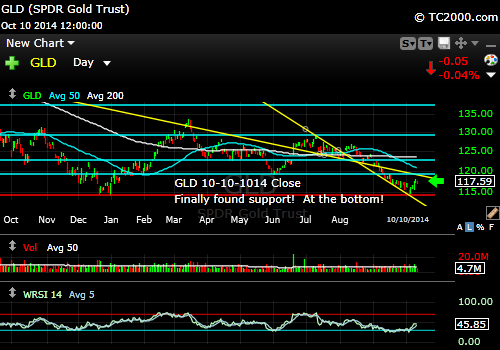 Gold: GLD, the gold ETF, held at the massive low we’ve been watching. Whew! Gold investors breathed a collective sigh of relief. That does not mean gold will keep holding if the world’s stock markets keep falling however, so we’ll be vigilant. The U.S. dollar came down a bit but needs to keep falling or gold will suffer further. There is room for gold to rally from here still. The 10 Year Treasury interest rate (TNX, tracked by TLT if Bullish; TBT if Bearish) was back testing a major low on Friday. 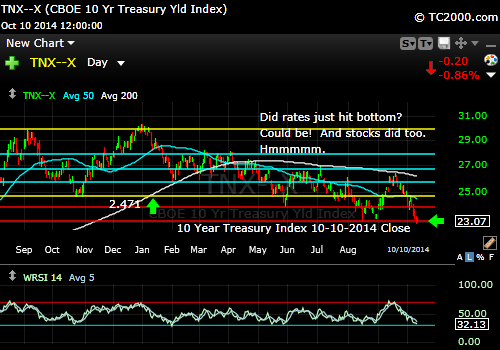 If rates don’t hold at that low, stocks will head lower still. So keep a keen eye on interest rates this week! Rates are falling but on support.